Retinal vessel changes and retinal whitening, distinctive features of malarial retinopathy, can be directly observed during routine eye examination in children with P. falciparum cerebral malaria. We investigated their clinical significance and underlying mechanisms through linked clinical, clinicopathological and image analysis studies. Orange vessels and severe foveal whitening (clinical examination, n = 817, OR, 95% CI: 2.90, 1.96–4.30; 3.4, 1.8–6.3, both p<0.001), and arteriolar involvement by intravascular filling defects (angiographic image analysis, n = 260, 2.81, 1.17–6.72, p<0.02) were strongly associated with death. Orange vessels had dense sequestration of late stage parasitised red cells (histopathology, n = 29; sensitivity 0.97, specificity 0.89) involving 360° of the lumen circumference, with altered protein expression in blood-retinal barrier cells and marked loss/disruption of pericytes. Retinal whitening was topographically associated with tissue response to hypoxia. Severe neurovascular sequestration is visible at the bedside, and is a marker of severe disease useful for diagnosis and management. Paediatric cerebral malaria (CM) is a frequently fatal complication of Plasmodium falciparum malaria that disproportionately afflicts children in sub-Saharan Africa; the WHO Malaria Report estimated that malaria killed 429,000 people worldwide in 2016, about 70% of whom were African children under 5 years of age (World Malaria Report 2016). CM is clinically defined as peripheral parasitaemia with coma not directly attributable to convulsions, hypoglycaemia, meningitis or any other identifiable cause (Newton et al., 1998). This definition is broad and is likely to over-diagnose a significant proportion of cases. The presence of a retinopathy known as malarial retinopathy (MR), and described by us with other colleagues (Lewallen et al., 1993; Hero et al., 1997; Beare et al., 2004; Harding et al., 2006), increases specificity when included in the diagnostic criteria (Taylor et al., 2004; Beare et al., 2011; Barrera et al., 2015). Sequestration of parasitised red blood cells (pRBC) in the cerebral neurovasculature is the key underlying pathophysiological feature in P. falciparum CM (Turner, 1997). Unlike in the brain, the degree and location of neurovascular abnormalities can be observed clinically in the retina using routinely available ophthalmological techniques (Harding et al., 2006). Features comprise orange or white retinal vessels, patchy or confluent retinal whitening and white centred retinal haemorrhages (Figure 1). Severity of MR predicts the risk of death and duration of coma (Beare et al., 2004; Lewallen et al., 2008; Beare et al., 2006). Principal features of malarial retinopathy (MR). (A) Montage image showing MR pathological features, including orange vessels (asterisks), white centred haemorrhages and whitening. (B) Corresponding fluorescein angiogram showing capillary nonperfusion (asterisks) mapping to retinal whitening. (C–D) Colour fundus image of retinopathy positive eyes (C, right; D, left eye; eyes were from different cases) showing orange intravascular material in large (arrowheads), small and postcapillary venules (asterisks), and capillaries; note retinal whitening also present. The management of P. falciparum malaria is changing. The incidence has fallen but is notoriously difficult to enumerate. Clearly, malaria is still causing significant numbers of deaths each year despite widespread use of artesunate-based combination therapies and moves to improve the early diagnosis of CM in district general hospitals (World Malaria Report 2016). New diagnostic and therapeutic interventions are being developed and tested. Our group has developed an automated algorithm platform for detection of MR from colour photographs (Joshi et al., 2017). We with other colleagues have previously reported descriptive pathological investigations of the features of MR (Lewallen et al., 2000), including clinical associations (White et al., 2009) and suggesting mechanisms. We have previously hypothesised that the orange vessels in the retina (Lewallen et al., 2000) and the intravascular material seen on fluorescein angiography may indicate sequestration (Beare et al., 2009), but definitive evidence is required. We have previously identified that retinal whitening is caused by capillary nonperfusion, but the relationship of this nonperfusion to sequestration is unclear. We studied orange and white vessels and retinal whitening to understand sequestration and its effects on the retina, and to inform clinical management of CM. We addressed these complex questions in a large series of children with CM recruited over 15 years all of whom had retinal examinations (clinical dataset), and in two subgroups, one comprising children who died and from whom eyes were available for histopathology (clinicopathology dataset) and a second of children who underwent retinal angiography (image analysis dataset). Findings from other cohorts and subcohorts from our programme have been reported previously by our group, addressing other research questions. The further analysis of our clinical dataset is an extension of our previous association study, while all other analyses presented in this manuscript are new. We investigated the clinical significance of orange vessels seen in children admitted between 1999 and 2014 who had a retinal examination within 24 hr of admission and who were retinopathy-positive. Representative clinical photographs are given in Figure 1. Figure 1—figure supplement 1, shows the patient allocation of 1684 children admitted to the paediatric research ward. The groups of subjects who did (n = 1160) and did not (n = 515) have an admission retinal exam were compared to assess possible selection bias (Supplementary file 1). Subjects who did not have an admission retinal exam were likely to have a higher serum lactate concentration (p<0.001) and were more likely to die (p<0.006). They were, on average, 5 months younger (p<0.001) and 0.2 kg lighter (p<0.01) than those who had retinal examinations. On admission, 817 subjects had retinopathy-positive CM. Of these, 137 (16.8%) died with the time from admission to death less than 24 hr for the majority. In 663 subjects, data were available recording the time taken to recover consciousness, and of these 200 (30.2%) reached Blantyre Coma Score (BCS) ≥3/5 within 12 hr, 214 (32.3%) did so between 12 and 24 hr, and 249 (37.6%) took over 24 hr. Missing data were low at <10% for most variables apart from: blood lactate (~20%), HIV status (15%) and disc hyperaemia (12%). Unadjusted associations between the presence and severity of clinical ophthalmoscopic features (Figure 1) and death in n = 817 with MR-positive CM, and admission eye examination, are shown in Table 1. Papilloedema (odds ratio (OR) 2.29, 95% confidence interval 1.55–3.38, p<0.001) and disc hyperaemia (OR 1.73, 1.15–2.62, p<0.01), both indicators of brain swelling, were more likely in those who died. White cell count and blood HRP2 concentration had statistically significant associations with death, but with very small effect sizes (OR very close to 1). 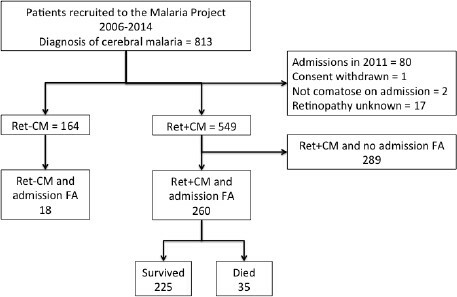 Associations with death in 817 subjects with admission retinal exam and retinopathy-positive paediatric cerebral malaria, 137 of whom died and 680 survived. Retinal features are presented for the worse eye. Estimates are from unadjusted logistic regression. p≤0.01 is bold. The presence of visible orange vessels on ophthalmoscopy (Figure 1C–D) was significantly associated with death (OR 2.90, 1.96–4.30, p<0.001), as was severe foveal whitening (>2/3 foveal area; OR 3.40, 1.80–6.30, p<0.001; simple logistic regression; Table 1). When including potential confounders (age, WCC, HRP2, lactate, papilloedema - see Materials and methods) in a multivariable regression model for the presence of the two retinal features with death, we found similar ORs and significance (orange vessels: OR 2.85, 1.72–4.74, p<0.001, n = 549; foveal whitening: OR 3.57, 1.57–8.13, p=0.002, n = 615). Twenty-nine cases from the autopsy archive met the inclusion criteria for our clinicopathological study of the nature and effects of retinal intravascular material; details of the dataset are given in Table 2, and records of pre-mortem retinal clinical examination in Table 3. Of these cases, 21 had MR (Grade 1 n = 5, Grade 2 n = 16). In all MR-positive cases, intracerebral and intraretinal sequestration of parasitised red blood cells (pRBC) post mortem exceeded 23% of capillaries and venules, consistent with a histological diagnosis of CM (Taylor et al., 2004; Barrera et al., 2015). Autopsy confirmed a cause of death different from CM in the eight MR-negative control patients (Grade 0). Twelve out of the 29 autopsy cases were HIV-positive. *MR = malarial retinopathy. Grade was defined based on percentage of retinal vessels with sequestration (Beare et al., 2004) as explained in Methods. Last peripheral parasitaemia (expressed as asexual pRBCs/μl blood), geometric means reported) was: 42,200 (Grade 0), 43,212 (Grade 1) and 9357 (Grade 2). ‡(Q)=number of retinal quadrants affected. §Vessels: Ven = venules; Cap = capillaries. #Localisation of vessel changes: I = inferior; N = Nasal; S = superior; T = temporal. ¶Haem = no. of retinal haemorrhages. ¥Extent of whitening is shown for macula in disc areas (DA). **Central whitening (overall score)=sum of macular and foveal whitening scores assigned as: 1 =<1/3 DA or FA, 2 = 1/3–1 DA or 1/3-2/3FA, 3 =>1 DA or >2/3FA. ††Papilloedema is the swelling of optic disc caused by increased intracranial pressure. The significance of papilloedema in cerebral malaria is not clear; however, it is the strongest risk factor for poor outcome among comatose children with clinical cerebral malaria. 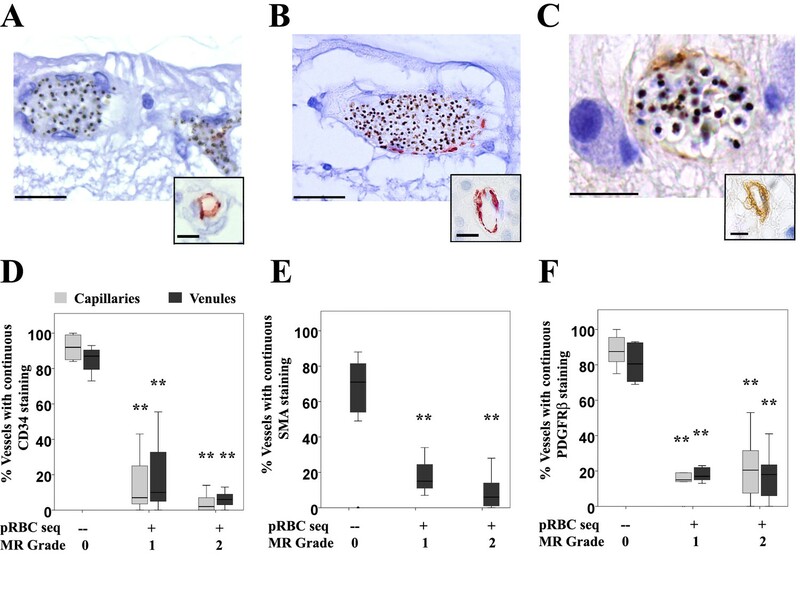 We investigated the nature of the intravascular material identifiable clinically and pathologically, primarily by colour changes in venules and capillaries, in 12 out of 21 MR-positive patients (Figure 2A–B). Intravascular filling defects (IVFD) within the blood column were identified in retinal venules on all the five cases with fluorescein angiography (FA) available. Orange and white microvessels (cases = 12, vessels = 212) were sampled using manual microdissection techniques (marked quadrant, Figure 2A), and compared microscopically with clinically normal vessels (cases = 8, vessels = 200) in different retinal segments of the same case or from different specimens across Grade 1 and Grade 2 MR groups. All orange vessels exhibited pigmented pRBCs sequestered in layers on the endothelium at the margin of the vessel lumen, with a blood column consisting of uninfected RBCs in the centre of affected vessels (Figure 2C, Figure 3). These vessels were occasionally surrounded by extravasated RBCs in the absence of clinically visible haemorrhage. White vessels (usually distended capillaries) contained primarily extraerythrocytic haemozoin (HZ) and some remnants of pRBC; non-parasitised RBCs were absent. Fibrin polymers were detected in retinal capillaries and venules (Figure 3—figure supplement 1). All vessels that appeared normal, during clinical and gross examination, lacked these features (Figure 2D). Vessel changes in malarial retinopathy. (A–B) Vessel colour changes (panels A-B) and intravascular filling defects (panel B, arrowheads) were identified during gross pathology examination (representative images of superior calotte and PO block from histology cases n. 5 and 7, respectively) N = 12. Abnormal vessels were sampled during gross pathology examination and analysed separately (see marked quadrant in panel A). (C–D) H and E staining of parasitised venules from MR cases sampled by punch biopsies from a retinal quadrant with (panel C shows the same orange vessel as in panel A) and without (panel D, case n. 15) vessel discolouration. (C) The margin of the vessel lumen has a near-complete layer of pigment-containing pRBCs (that stain less intensely pink than the adjacent non-parasitised RBC) on the endothelium. (D) Mild sequestration of pRBCs which is marked by an arrowhead. Scale bars (50 μm, (C–D). Severe pRBC sequestration in large venules and arterioles in MR with visible vessel discolouration. 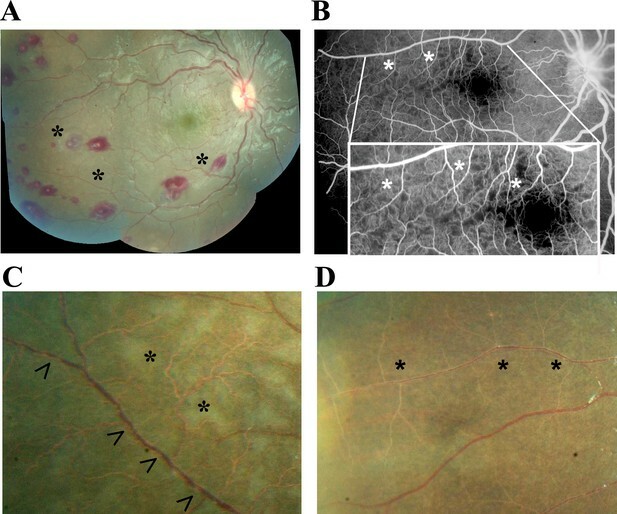 (A–B) Longitudinal section of large retinal venule from retinal area affected by intravascular filling defects on fluorescein angiography (histopathology case no. 9) analysed by H&E staining (A) and anti-fibrinogen IHC (B). Clusters of pRBC are seen within the vessel lumen and attached to the wall. (C) Cross section of a large retinal arteriole with moderate pRBC sequestration (case n. 5). Arteriole is surrounded by haemorrhage, probably of a venular origin as arteriolar vessel wall appeared intact (in multiple sections). Scale bars: 50 μm (all panels). H&E analysis of orange intravascular material (n = 3 cases) showed aggregates containing both abundant sequestered pigmented (late stage) pRBCs and non-parasitised RBCs in venules (Figure 2C, Figure 3A–B). These clusters of pRBC were not observed in vessels without FA filling defects from the remaining two MR-positive cases for which FA was available. We investigated the relationship between severity/extent of late stage pRBCs and presence of visible orange discolouration in nine MR-positive cases (n = 412 vessels studied; Table 4). Vessels with sequestered late stage pRBCs involving 360° of the circumference of the vessel lumen were strongly associated with the presence of orange discoloration (Table 4). Sensitivity and specificity for orange discolouration as an indicator of this extent of sequestration were 0.97 (95% confidence interval: 0.94 to 0.99) and 0.89 (0.84 to 0.93), respectively, with positive and negative predictive values of 0.88 (0.83 to 0.92) and 0.98 (0.94 to 0.99). We studied the effects of pRBC sequestration on cellular vessel wall components in MR-positive and negative cases, in vessels with and without sequestered pRBCs in matched tissue sections assessing presence/absence of continuous (annular) immunostaining. In both Grades 1 and 2 MR-positive cases, intraretinal sequestration was significantly associated with reduced expression in retinal microvessels of the endothelial cell membrane glycoprotein CD34, the pericyte structural protein smooth muscle actin (SMA) and the signalling molecule platelet derived growth factor receptor β (PDGFRβ) (Figure 4, all p<0.005); SMA was only reported for venules as it does not produce an annular staining pattern in normal capillaries. The proportions of continuous immunostaining in capillaries and venules, with and without pRBC sequestration, respectively (means ±SD), were: CD34, 14 ± 9% and 90 ± 10%; SMA 11 ± 10% and 65 ± 25%; PDGFRβ 19 ± 15% and 77 ± 18% (all p<0.005). These findings are consistent with marked altered cell function or loss of pericytes and endothelial cells of vessels with pRBC sequestration. To explore the impact of pericyte dysfunction on vessel stability, we tested for an association between reduced immunostaining and presence of retinal haemorrhages. Percentages of vessels with normal PDGFRβ staining were significantly less in MR-positive cases with haemorrhages (18%) than those without (39%; n = 21, p<0.05). 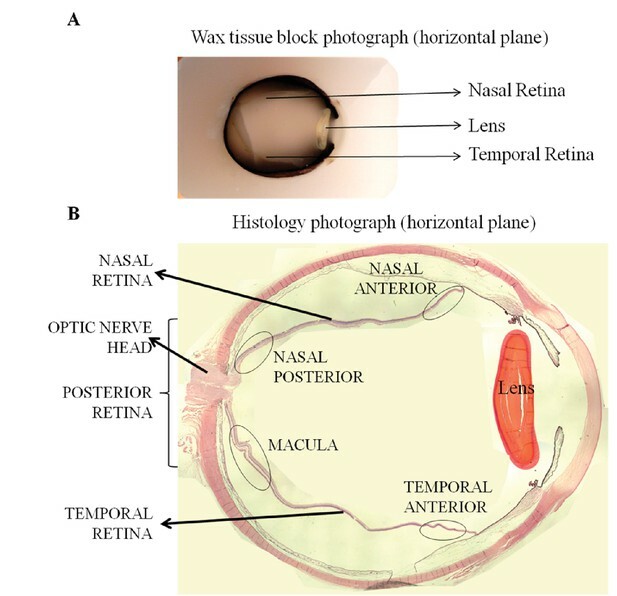 Vascular changes in retinal vessels in malarial retinopathy. (A–I) Expression of endothelial CD34 (panel A: case n. 3, inset: case n. 25 and D: box plot), pericytic SMA (panel B: case n. 12, inset: case n. 27 and E: box plot) and pericytic PDGFRβ (panel C: case n. 13, inset: case n. 26 and F: box plot) markers. Insets show normal annular staining in absence of pRBC sequestration, whereas this annular pattern is lost in the sequestrated vessels seen in A-C. SMA was only reported for venules as it does not produce an annular staining pattern in normal capillaries: panel E. N = 17 for CD34; N = 29 for SMA and PDGFRβ immunostaining. ANOVA was used to compare means. **p<0.005. Scale bars: 20 μm (A–C), 5 μm (insets). Glial cells (principally astrocytes and Müller cells) surrounding venules and capillaries affected by severe pRBC sequestration were studied in 10 of 21 (48%) MR-positive cases (Figure 5A–D). There were statistically significant increases in perivascular astrocyte intercellular adhesion molecule 1 (ICAM-1) (p=0.003) and Müller cell cytoskeletal component glial fibrillary acidic protein (GFAP) (p=0.034), markers for early (4–12 hr) and late (after 24 hr) glial activation, respectively (Lee et al., 2000; Hiscott et al., 1984). No MR-negative cases showed perivascular ICAM-1 or GFAP immunoreactivity. ICAM-1 tissue staining was also associated with the presence of discoloured vessels (Figure 5A, all Fisher exact tests p<0.05), compared with normal vessels where ICAM-1 was restricted to the endothelium (Figure 5B). Müller cell GFAP immunoreactivity was observed in 8 of the 21 (38%) cases with MR (Figure 5C) versus MR-negative cases (Figure 5D) where staining was restricted to the first retinal layer. Activation of retinal glial cells in malarial retinopathy (MR). (A–B) Anti-ICAM-1 staining of MR-positive cases with (case n. 16, panel A) and without (case n. 13, panel B) vessel discolouration. Haematoxylin (blue) counterstain was used. (C–D) Anti-GFAP staining of orange-discoloured vessels in punch biopsy from MR-positive case n. 5, and in MR-negative case n. 25. Haematoxylin counterstaining was omitted here. In A and C, peri-vascular activated astrocytes and Műller cells are marked with arrowheads, and asterisks label Műller cell bodies. Scale bars: 50 μm (all panels). To test the hypothesis that retinal whitening is caused by hypoxia-induced cellular oedema (Kaur et al., 2008a), we compared the proportions and distribution of the tissue hypoxia and intracellular oedema markers VEGFR1 and AQP4, respectively (Marti et al., 2000; Medana et al., 2011), in MR-positive and negative cases. MR-positive cases showed increased expression of VEGFR1 immunoreactivity in both central and peripheral retina. VEGFR1 immunostaining was primarily localised in the inner retina (Figure 6A,B) (ganglion cell (primarily in the macula) and inner nuclear cell bodies and synapses) and values were positively correlated with increasing severity of whitening for all these cells (Figure 6C p<0.05, p<0.001) and for macular ganglion cell layers with worse MR (Figure 6D, p<0.001). Clinicopathological association between retinal whitening in the macula and increased VEGFR1 expression in malarial retinopathy. 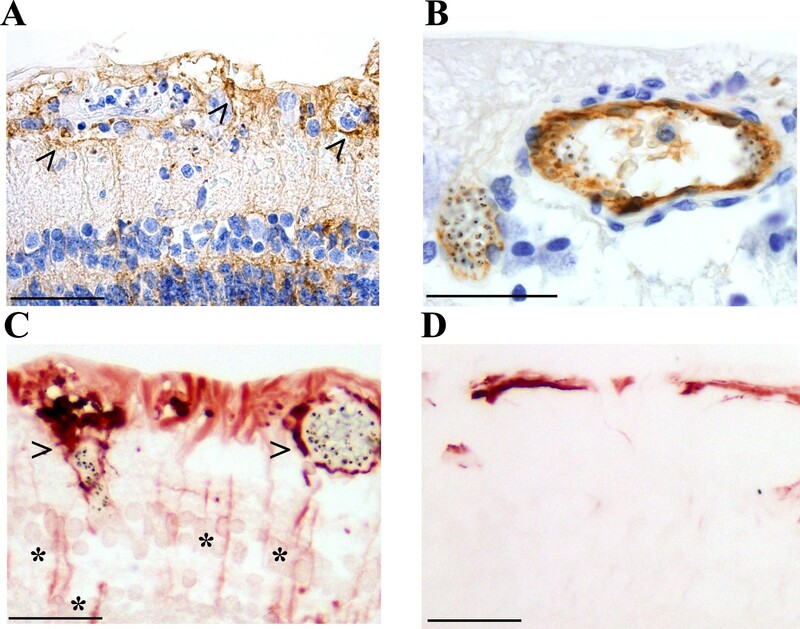 (A–B) Immunostaining pattern in macula affected by whitening (case no 9) (low (A) and high (B) magnification; VEGFR1 +ve ganglion cell bodies indicated by arrowheads). (C) Cluster column chart showing densitometrically assessed intensity of immunoreactivity (‘value’) of VEGFR1 expression plotted by retinal layer against whitening severity, compared with MR –ve cases. Ganglion cell layer = GCL (blue); inner plexiform layer = IPL (green); inner nuclear layer = INL (light brown); outer plexiform layer = OPL (purple). (D) VEGFR1 levels in the GCL plotted against MR severity classification groups (grade 0 = none, 1 = mild, two moderate/severe). Means ± SD are reported in both charts; ANOVA was used to compare means (N = 26). *p≤0.05 and **p≤0.001. Scale bars: 50 μm (panel A); 20 μm (panel B). AQP4 expression levels were generally more intense in MR-positive cases with whitening (Figure 1B) than those without (Figure 7, Figure 7—figure supplement 1). 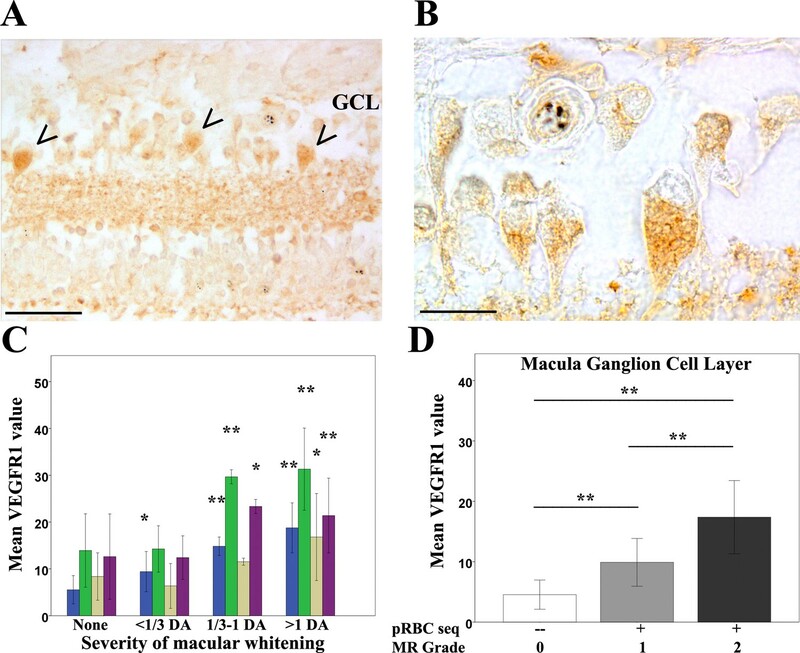 High AQP4 staining levels were found in glial cells, including Műller cells, in the nerve fibre layer (NFL) and outer plexiform layer (Chen et al., 2012) in the macula (Figure 7A,B) and temporal periphery (Figure 7—figure supplement 1A,B). Densitometry analysis showed significantly higher AQP4 levels for macula and temporal periphery (Figure 7C and Figure 7—figure supplement 1, ANOVA test, p<0.05 except moderate whitening). There were statistically significant associations also between AQP4 staining pattern and MR grade (Figure 7D and Figure 7—figure supplement 1). In addition to the association found between tissue whitening, VEGFR1 and AQP4 expression levels, in 44% and 68% of MR-positive cases (macula and periphery respectively) intravascular thrombi were co-localised with retinal whitening (Figure 3—figure supplement 1A–C; p<0.05 for periphery only). Clinicopathological association between retinal whitening in the macula and increased AQP4 expression in malarial retinopathy. (A–C) Immunostaining pattern in the macula with (A-B, case no 13) and without whitening (C, case no 21). Parasitised vessels are marked by arrows. The vertical linear pattern indicates Műller cell immunoreactivity for AQP4. (D) Cluster column chart showing densitometrically assessed intensity of immunoreactivity (‘value’) of AQP4 levels measured by IHC in the macula by retinal layers: nerve fibre layer = NFL (red), ganglion cell layer = GCL (blue), inner plexiform layer = IPL (green), outer plexiform layer = OPL (purple). (E): AQP4 levels in the nerve fibre layer plotted against MR severity classification groups (grade 0 = none, 1 = mild, two moderate/severe). Means ± SD are reported in all graphs; ANOVA was used to compare means (N = 26). *p<0.05 and **p<0.001. Scale bars: 50 μm (panels C, E, F and G); 10 μm (panel D). Between 2009 and 2014, 260 subjects with MR-positive CM underwent retinal FA on the day or day after admission. A representative FA of IVFD is shown in Figure 1B, with the dataset in Figure 8 and the rates and location of IVFD in Table 5. The topographical correlation between ophthalmoscopic and angiographic features of IVFD is illustrated in Figure 9. IVFD occurred frequently in the retinal venules (large 80.2%, small 98.0%, post capillary 98.3%). There was no association between sequestration in post-capillary venules and survival (OR 0.23, 0.054–1.02, p=0.053). Conversely, sequestration was infrequent in the arterioles but with significant associations with death for large arteriole sequestration (OR 2.81, 1.17–6.72, p<0.02), and non-significant association for precapillary arterioles (OR 2.47, 0.94–6.45, p=0.065) (see Table 5 and Figure 9). Similar findings were found for time to recovery of consciousness (binomial regression coefficient, 95% CI): precapillary arterioles (0.32, 0.094–0.55, p<0.01), small arterioles (0.30, 0.093–0.51, p<0.01), large arterioles (0.38, 0.076–0.68, p<0.02). Sequestration in the capillaries was frequently seen but was ungradeable in 62% of cases. Flow chart describing fluorescein angiography dataset. Visible sequestration in the retinal neurovasculature. (A–D): Orange intravascular material is seen in the retinal venule (A, C) which co-localises to the intravascular filling defects on fluorescein angiography (D) (see arrows). Chart (B) shows the frequency of visible sequestration in six microvessel types in 259 subjects with retinopathy +ve CM and the odds ratios of death within the admission. The results of our semi-quantitative image analysis to investigate the value of retinal sequestration to predict disease outcome are shown in Figure 10, including an example of the output from the algorithm (Figure 10A). Data were available on 251 eyes (one eye per case), and there were 33 (13.1%) deaths. The mean ratio of affected:unaffected vessels was 41.9% in children who died and 37.8% in survivors. The distribution of ratios across the 251 eyes is shown in Figure 10B; the amount of IVFD in retinal vessels was higher in the patients who died in our study, but the difference did not reach statistical significance (OR 18.05, 0.74–211.33, p<0.08). Semiautomated quantitative analysis of sequestration by length of affected vessel. (A) Example image of semiautomated system to show vessels affected by sequestration (red). (B) Chart showing distribution of proportion of detected vessel affected by sequestration related to survival in 251 eyes (one eye per case). The clinicopathological findings from our unique cohort provide strong evidence that the orange appearance of retinal vessels in comatose children with a clinical diagnosis of CM is caused by sequestered late-stage pRBCs. Our dataset of clinical outcomes, the largest to date, and our independently graded angiographic data show that this visible sequestration is strongly associated with death, with an increased risk when arterioles are involved. The tissue effects of sequestration are widespread within the neurovascular unit, including novel findings of severe loss/disruption of pericytes. Retinal whitening, also strongly associated with death, is associated with features of cytotoxic oedema, consistent with sequestration causing ischaemia. We used three datasets to investigate if the features seen clinically in the retina represent sequestration, which is the principal underlying pathophysiological event in P. falciparum malaria. Our data from 817 children point definitively to the importance of sequestration seen clinically as visible orange vessels, associated with a 2.71-fold increased odds of death. Our data add to previous work by us (Beare et al., 2004) but with greater confidence and with specific reference to orange vessels rather than all retinal vessel abnormalities. The orange colour of the sequestered intravascular material appears to be a result of a mix of sequestered late-stage pRBCs (containing haemozoin) adherent to the endothelium, surrounding a central narrowed blood column consisting of uninfected RBCs. Our numbers of cases and controls are typical for this type of pathological study and the numbers of vessels sampled were high. Our findings add to those reported by some of us previously (Lewallen et al., 2000), which described dehaemoglobinised RBCs in sequestration, by adding new topographical clinicopathology data. We found that sequestration involving 360° of the circumference of the vessel lumen was strongly associated with the presence of orange discolouration clinically. We think orange vessels can be considered as an indication of severe sequestration and, as such, are clinically extremely valuable. This severe sequestration is easily visible with indirect ophthalmoscopy after pupil dilation. Less severe sequestration may be detectable with the newly available technology of hand-held optical coherence tomography (OCT) of the retina. Retinal capillary involvement, in contrast to orange vessels, appears to be a phenomenon in CM not associated with death. Clinically, this is visible as white vessels and histologically predominantly as ruptured RBCs and extra-erythrocytic haemozoin, with no intact or non-parasitised RBCs. This feature was associated with non-perfusion on FA. Our large fluorescein angiography (FA) study, which extended over eight seasons, shows that the retinal intravascular material was seen in nearly all MR-positive cases, especially the post-capillary and small venules (98.3% and 87.9% of gradeable vessels, respectively). These findings are novel, whereas our and others’ earlier data have been descriptive. The limitations of imaging in comatose young children mean that our grading method was unable to reliably identify capillaries, and so we were unable to robustly investigate the capillaries angiographically. 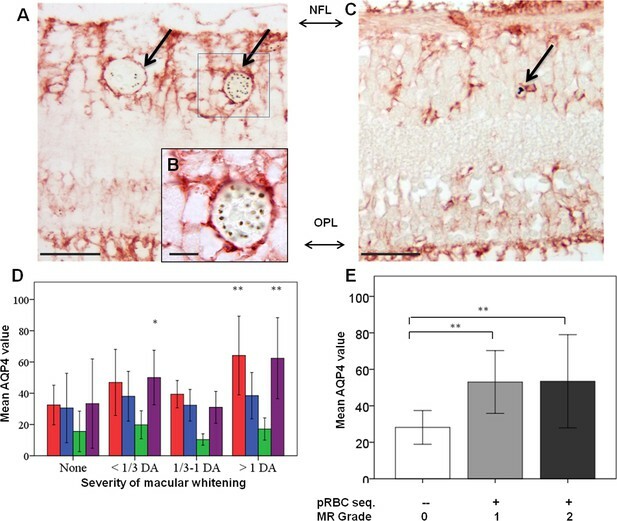 We believe that capillary involvement is typical of pRBC sequestration in the neurovasculature. The presence of intravascular material in the arterioles was much less likely (pre-capillary 58.4%, small 43.9%, large 15.3%). However, arteriolar intravascular material was associated with longer recovery times (p<0.01- < 0.02) and greater risk of death, with involvement of the large arterioles conferring a 2.81-fold increased risk of death. It appears that the involvement of the arteriolar side can be taken as a clinical marker of severity, indicating a greater extent or load of sequestration. We have previously described the features of intraretinal material coining the term ‘intravascular filling defects’. This FA term can now be replaced by ‘retinal sequestration’. 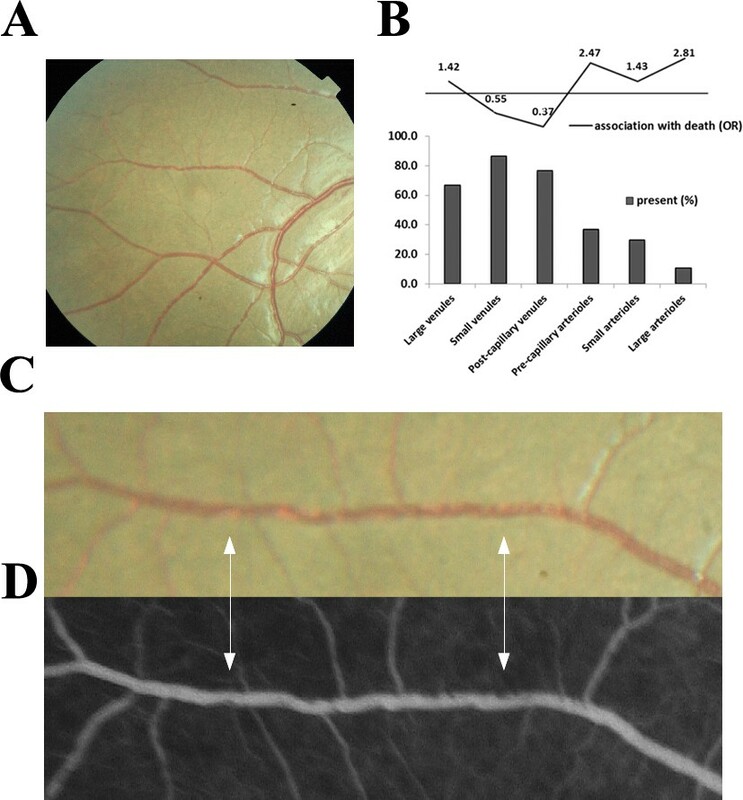 We identified an association between sequestration and profound changes in the cells of the retinal neurovascular unit. These cells are critical to the preservation of BRB function (Kaur et al., 2008b) and the changes have important parallels in the brain, especially for swelling (Seydel et al., 2015). Reduced expression of CD34 in endothelial cells and of SMA and PDGRFβ in pericytes indicates significant dysfunction of both cell types. Our pericyte data are novel; pericytes have not been extensively studied in malaria before, with only one study reporting pericyte vacuolation in adult fatal CM (Pongponratn et al., 2003). Reduction of SMA immunoreactivity may be related to two pathological mechanisms: vessel dilatation with altered pericyte function, or pericyte loss. PDGF-signalling is critical for the survival of endothelium in physiological conditions (Armulik et al., 2005). Pericytes are highly sensitive to hypoxia (Kamouchi et al., 2012), especially in brain and retina where they are most abundant, and when vessels lose or develop abnormal pericytes they become hyperdilated, show signs of vessel dysfunction, and haemorrhage may occur (Bergers and Song, 2005). Within the MR cases, we found more retinal vessels with abnormal pericyte staining in those cases presenting with retinal haemorrhages than those cases without. The retina and brain present similar pathological features in CM, including haemorrhages (Greiner et al., 2015). We found the same significant loss of pericytic SMA and PDGFRβ in a further small analysis comparing brain microvessels in the presence of pRBC sequestration (median %, min-max% of vessels with SMA intact: 15%, 9–20%; PDGFRβ: 13%, 6–24%) with non-parasitaemic vessels (SMA intact: 92%, 79–100%; PDGFRβ: 96%, 91–100%) (p<0.001 for all) (n = 5; Barrera V et al, unpublished). These data suggest that retina and brain may have similar dysfunction/loss of pericytes in fatal paediatric CM. We also identified effects on astrocytes and Müller cells indicating wider effects on neural retinal cells than previously identified. Late reactive (Hiscott et al., 1984) GFAP was upregulated, but the greater effect was seen for the early-responsive (Ortinski et al., 2010) perivascular ICAM-1 perhaps reflecting the short survival time of children with fatal CM. Our group has also previously identified upregulation of β-amyloid precursor protein as evidence of axonal damage (White et al., 2009). These neuroglial effects of retinal sequestration are likely to be widespread and include disturbance of tight junction regulation causing BRB/BBB breakdown with vasogenic oedema, an implicated pathway for brain swelling and death (Taylor et al., 2004; Mohanty et al., 2017). Retinal whitening is a key feature of MR. Our finding of whitening at the fovea conferring a 3.4-fold increased risk of death strengthens our previous findings (Beare et al., 2004). We have previously shown that retinal whitening is topographically associated with capillary non-perfusion and is found in watershed zones of the retina, sites of high metabolic demand (Beare et al., 2009), suggesting that tissue hypoxia is a principal pathogenic pathway (White et al., 2009). Our immunohistochemistry data provide further evidence that the inner retina is affected by tissue hypoxia and intracellular oedema. Ganglion cells showed increased expression of VEGFR1, which, in combination with VEGF, is neuroprotective during ischaemia (Saint-Geniez et al., 2008). Glia in retinal zones where whitening is mainly localised were found to express AQP4, a water channel protein linked to hypoxic oncotic swelling. This observation is supported by our previous electrophysiologcal study, which showed abnormal B wave implicit time indicating inner retinal dysfuction in retinal whitening (Lochhead et al., 2003). This all supports inner retinal neuronal ischaemia as opposed to dysfunction of the outer retinal photoreceptors and choroidal circulation. Further studies with the OCT may shed new light on the retinal whitening. We have some conflicting evidence on the importance of capillary non-perfusion (CNP). There are undoubted tissue effects of sequestration-induced hypoxia in the vessel and extending into the neuroretina causing tissue swelling and opacification. However, the whitening seen in capillaries was not associated with death, and sequestration seen in the post-capillary venules on FA, a frequent association with CNP, showed a trend for survival. Sequestration in post-capillary venules is more common than arterioles, and this suggests these children as a group were not as critically ill as those with sequestration extending additionally into arterioles. So how can our findings affect the clinic management and future research directions in CM? The detection of orange vessels on clinical examination has a high sensitivity and specificity for a severe degree of sequestration, which is associated with death. Sequestration detectable on FA in the arterioles, and especially the large arterioles, is also predictive of death and probably indicates a high parasite load. Orange vessels can be seen clinically with the indirect and direct ophthalmoscope through a dilated pupil by a trained physician (Taylor et al., 2004), but these skills are mainly available in research or tertiary centres in malaria endemic areas (Swamy et al., 2018). We have with others recently developed MR detection algorithms offering a potential automated diagnostic tool for severe malaria in district hospitals (Joshi et al., 2017). Our new clinical markers of severe disease and poor outcome (visible orange vessels and arteriolar involvement indicating severe sequestration, and severe foveal whitening) should be a focus for diagnosis and management. It should be recognised that including children without MR in clinical trials is likely to reduce their power to detect an effect of an intervention on CM outcomes. There is good evidence that the clinicopathological features of CM in the retina parallel those seen in the brain (Barrera et al., 2015; MacCormick et al., 2014): ring-shaped haemorrhages (White et al., 2009; Dorovini-Zis et al., 2011), pathology of sequestration, associations between retinal features and that key neurological pathways seem to be non-functioning ('pathways to neural cell death'). Mendis K and others (Mendis et al., 2009) have argued that the long-term goal of eliminating malaria remains dependent on continuing research and the development of new drugs and therapeutic strategies to sustain control programmes. Better identification and treatment of severe malaria will also be needed. Our findings from manual and semiautomated image analysis provide an indication that quantification of the load of retinal sequestration is promising as a useful metric in clinical trials and merits further development to identify a severity cut-off. The results we have presented in this paper from our long-term programme of research strongly support the concept that sequestration can be identified clinically in the retina at the bedside, and offer important new insights into the widespread effects of sequestration on the neural microvasculature and cells of the neurovascular unit. This sequestration can be seen in clinical practice at a critical time in the management of the comatose child in malaria endemic areas offering opportunities to study the effects of new therapies, as well as an early concrete diagnosis and a marker of severe disease. †Host: Rb = rabbit; Ms = mouse; mAb = monoclonal antibody; pAb = polyclonal antibody. ‡Ag retrieval: heat-mediated antigen retrieval was performed in high pH solution (10 mM Tris/1 mM EDTA, pH 9.0) or low pH solution (trisodium citrate 10 mM, pH 6.0). Proteinase K was from Dako (ready-to-use solution). §Dilution and incubation time: RT = room temperature; o.n. = over night. #Chromogen: AEC: 3-amino-9-ethylcarbazole; DAB = 3,3'-diaminobenzidine. Reported references are from main manuscript. A research programme based in Queen Elizabeth Central Hospital (QECH) and the College of Medicine in Blantyre, Malawi since 1996 provided the setting for the study. A prospective cohort of children (clinical dataset) was recruited between 1999 and 2014. A subcohort was selected for ocular histopathology (clinicopathology dataset, 1999–2011) and a second recruited for retinal photography (image analysis dataset, 2006–2014). The core and specific studies all received approval from the research ethics committee at the University of Malawi College of Medicine P. 11/07/593, Michigan State University and the Royal Liverpool and Broadgreen University Hospital Trust n. 3690. Research was performed in accordance with the Declaration of Helsinki. Written consent for the clinical eye examination was sought in English or in the language of the parent/guardian who gave permission on the patient’s behalf. If a patient died, additional informed written consent for autopsy was sought from the parent/guardian (Taylor et al., 2004; Milner et al., 2013). Children admitted to the Paediatric Research Ward of QECH with coma and suspected CM who met the definition of CM: presence of coma (Blantyre Coma Score (BCS) <2) and P. falciparum parasitaemia, in the absence of any other identifiable cause of coma (including meningitis, hypoglycaemia or postictal state of ≤2 hr) (Taylor et al., 2004). After initial stabilisation by the admitting paediatrics team, cases had pupils dilated and were examined by binocular indirect ophthalmoscopy with standardised data recording (Harding et al., 2006). Demographic, clinical and outcomes data (survival, death, time to recovery of consciousness (BCS ≥3)) were recorded and analysed (Table 1) after dual entry as previously described (Seydel et al., 2015). Peripheral parasitaemia, haemoglobin levels and HIV-1 serological status were determined as previously described (Taylor et al., 2004). Clinicopathological cases were identified from an autopsy study performed between 1996 and 2010, which enrolled children who died of CM and parasitaemic children who died of other causes. Autopsy was performed to international standards within 12 hr of death. Clinical diagnosis of CM was from post-mortem brain analysis (Taylor et al., 2004). Specimens were obtained from the archive with: a full clinical eye examination performed during life, available severity grading of specific MR features, a clinical diagnosis of CM (see above) and evidence of valid consent (see below). Key pathology methods are given here, with further details available in Appendix 1. Eye specimens were anonymised, coded and, after fixation in 10% v/v neutral buffered formalin, processed as previously described (Barrera et al., 2015; White et al., 2009). Specimens were opened either horizontally in the pupil-optic nerve (PO) plane, or vertically. 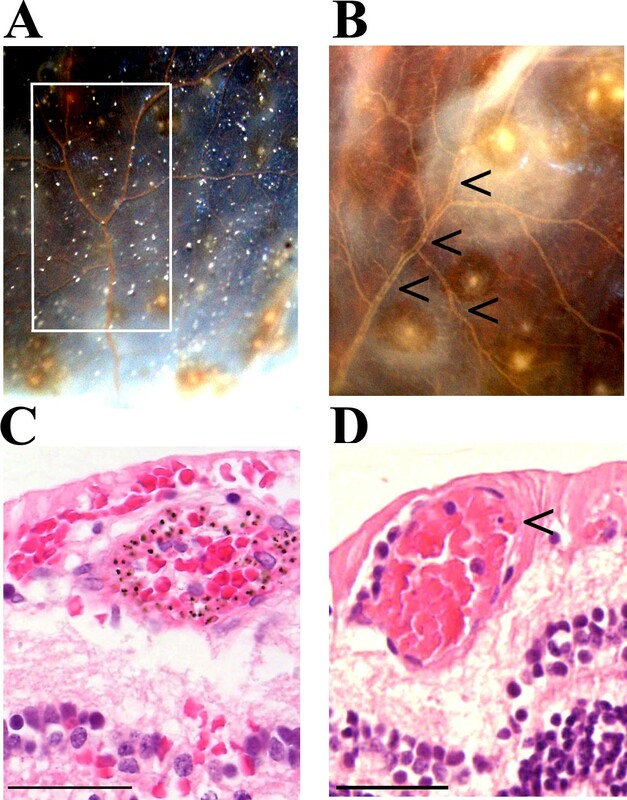 Retinal pathological features, such as orange/white vessel discoloration and intravascular material, were photographed and sampled using punch biopsies before wax embedding. Classification of the retinal zones used to compare levels of histological markers with severity of MR features detected during grading is described in Appendix 2. All histopathological observations were performed masked to MR status. Up to 100 sequential sections were cut for each specimen and stained for H&E, Martius-Scarlet-Blue or immunohistochemistry. For detection of parasitic stage and elements in retinal vasculature, H&E stained sections were assessed for presence of pRBCs, and intra- and extra-erythrocytic HZ (Barrera et al., 2015). Percentages of capillaries and venules parasitised were calculated per MR grade (means ±SD reported): 6 ± 5% (grade 0); 54 ± 12% (grade 1); 87 ± 16% (grade 2). Vascular endothelial growth factor receptor 1 (VEGFR1) and aquaporin-4 (AQP4) immunostaining were quantified by retinal layer, using a densitometry-based automated analysis method on eight randomly selected fields per section (see Appendix 1). For the vascular-related antigen markers (see Key Resources Table), the numbers of immunoreactive retinal vessels or segments were counted manually by one of the authors (VB) and at least one second independent observer (TF, SM or DG, see Acknowledgments). At least 100 capillaries and venules were analysed in each case and an inter-observer error count of less than 10% considered acceptable, otherwise a third observer assessed the case. Children deemed by the admitting paediatrician to be sufficiently stabilised clinically underwent colour photography and FA following previously published protocols (Beare et al., 2004; Harding et al., 2006; Beare et al., 2009). Subjects were excluded if their guardians withdrew consent, if their clinical condition was deteriorating or rapidly improving to normal consciousness, or if the ophthalmologist was not available. A trained ophthalmologist graded the FA images against previously published protocols developed by the Liverpool Ophthalmic Reading Centre (MacCormick et al., 2015). Classification of retinal zones is described in Appendix 2 and used standardised validation procedures. The following were included: presence/absence, extent and distribution of whitening, vessel discolouration (divided into orange and white vessels as per analysis), haemorrhages and papilloedema. An automated segmentation algorithm was developed (method described elsewhere [Zhao et al., 2015]) to identify vessels with IVFD, applied to the macular image with best field definition and clarity from one eye of each case and analysed by proportion of vessel affected by IVFD/proportion not affected. Relationships between clinical dichotomous outcome and studied variables was first analysed using simple logistic regression. To test for confounding, a multivariable logistic regression model was fitted within the clinical dataset, adjusting for variables significant at p<0.01 (Table 1) and including age. We did not include variables not fulfilling those described by Greenland et al. (Greenland et al., 1999): coma score (part of the causal pathway to death) and retinal haemorrhages (orange vessels can evolve to haemorrhages because of sequestration affecting vessel stability). Potential bias because of missing data was investigated by comparison between subjects examined and not examined. Coma recovery time was truncated at zero and highly skewed with over dispersion, and so we used truncated negative binomial regression to estimate unadjusted associations with this outcome. Clinicopathological correlation analyses used data from the last clinical examination before death and one eye per subject. After quantitative evaluations were completed, specimen codes were broken and results compared with the clinical data. Continuous scale data were assessed for normal distribution with the Shapiro-Wilk test. When normality was satisfied, one-way ANOVA (with Bonferroni post-hoc correction) was used to compare continuous scale data across MR severity groups, or retinal layers. Spearman correlation (with significance at p<0.01) was used to correlate a continuous scale variable with severity grades for macular and peripheral whitening. Fisher exact test was used to compare categorical variables (e.g. ICAM-1 or GFAP perivascular staining, discoloration presence/absence) and p values < 0.05 were considered significant after adjustment where appropriate for multiple comparisons. SPSS Statistics 22 was used throughout. The anonymised datasets for this study – clinicopathology dataset (author: Valentina Barrera), clinical dataset (author: Ian MacCormick) and FA dataset (authors: Ian MacCormick and Yalin Zheng) – are stored at the University of Liverpool Research Data Management Archive (datasets archive created on 20/02/2018). Given the confidential nature of these data (clinical and histology images and clinical examination forms of the patients (with DOB, date of death, clinical parameters, cause of death), access is subject to reasonable request through the senior author, Simon P. Harding (sharding@liverpool.ac.uk), and to approval by the Malawi Malaria Consortium Data Oversight Committee (Terrie E. Taylor Director, Blantyre Malaria Project (ttmalawi@msu.edu) and SJ Gordon, Director and Chair Research Strategy Group, MLW Clinical Research Programme (sgordon@mlw.mw)). Pupil-optic (PO) nerve wax blocks were cut into sections, and H&E stained to identify retinal areas for topographical correlation and subsequent histopathology (Appendix 1 Figure 1). Orientation and topographical association in whole eye histology blocks (A) and in eye sections (B), used to perform correlation studies between fundal images and histology. Histology photographs were taken from randomly selected fields in each retinal area (macula, nasal posterior, nasal and temporal periphery) in sequential sections stained for immunohistochemistry markers, and used to measure marker intensity (see VEGFR1 and AQP4 analyses). The macula is clearly identifiable histologically, due to a higher density of ganglion cell nuclei compared to other retinal areas (see section below). Optic nerve head and optic disc were used as matching references in histological and clinical photographs respectively. The retinal area on the nasal side of the optic nerve head (nasal posterior, also defined as near periphery; Appendix 2—figure 1 panel B) corresponding to retinal zone 1 in the periphery (Appendix 2). Nasal and temporal anterior areas were considered matches for zone 2–3. Eyes were examined macroscopically in 70% v/v ethanol with a dissecting microscope and orange/white discoloration of retinal vessels, intravascular material and retinal haemorrhages were recorded photographically. Punch biopsies (N = 4, see Table 2, main manuscript) were performed post-mortem to obtain individual retinal lesions. Calottes were also used to sample individual retinal features, after sectioning into small tissue strips (N = 7). Tissue samples were dehydrated and embedded in paraffin wax. Sections, 3–4 µm thick, were cut with a manual rotary microtome for staining. Sections were deparaffinised, rehydrated and stained with standard hematoxylin-eosin (H&E) or with the indirect immunoperoxidase technique (see Key Resources Table for antigen retrieval treatment and list of antibodies). Endogenous peroxidases and non-specific binding were blocked by treating rehydrated sections with 0.3% v/v hydrogen peroxide (15 min; Dako) and 20% v/v goat serum (Sigma Aldrich) respectively. Ready-to-use Dako EnVisionTM + System HRP was used for immunostaining (Key Resources Table). Anti-rabbit-HRP and anti-mouse-HRP secondary antibodies were incubated for 30 min. Negative and positive control experiments were run in parallel using, respectively, isotype control antibodies on retinal samples or tonsil. Other ocular tissues, such as optic nerve, choroid and ciliary body, were used as internal positive or negative controls. Microscopic investigations were carried out with an Olympus BX60 system microscope. Images were taken with an Olympus DP71 microscopic digital camera and cell imaging software (Olympus). The retina is customarily divided into ten layers identifiable on H&E stained light microscopy (Appendix 1—figure 2). Panel A: retinal structure on light microscopy (H&E staining). Panel B shows the specific feature of >1 cell thickness in the ganglion cell layer, used to identify the macula. Retinal layers from inner to outer are: inner limiting membrane, nerve fibre layer (NFL), ganglion cell layer (GCL), inner plexiform layer (IPL), inner nuclear layer (INL), outer plexiform layer, outer nuclear layer (ONL), outer limiting membrane, photoreceptor outer segments (rod and cone), retinal pigment epithelium. The retinal neurovasculature is localised in the GCL and INL, with a capillary network in each and it forms the inner blood retinal barrier (BRB) comprising endothelial tight junctions and maintained by additional perivascular cells (astrocytes, Müller cells and pericytes. RPE tight junctions form the outer BRB. The macula is identified in histological sections by the presence of more than one ganglion cell nucleus in the GCL (Appendix 1—figure 2B). The antibodies used to investigate the tissue effects of intravascular material are listed in Key Resources Table. IHC staining was quantified per retinal layer in each image by Image J 1.49 v (NIH, http://rsb.info.nih.gov/ij/). RGB images were converted to grey scale images without changing brightness or contrast, and regions of immunolabelling were selected by density thresholding. Low and high thresholds were selected by comparison of the staining intensity on similar sections from MR negative cases, and the thresholds were kept constant between cases for each marker using internal standards. Data were reported as area of microphotographs covered by the immunolabelling, normalised against the background (eye vitreous intensity). Definitions of retinal zones for grading of clinical photographs and for the topographical clinicopathological study are shown in the Figure below. Retinal zones used for clinical grading. 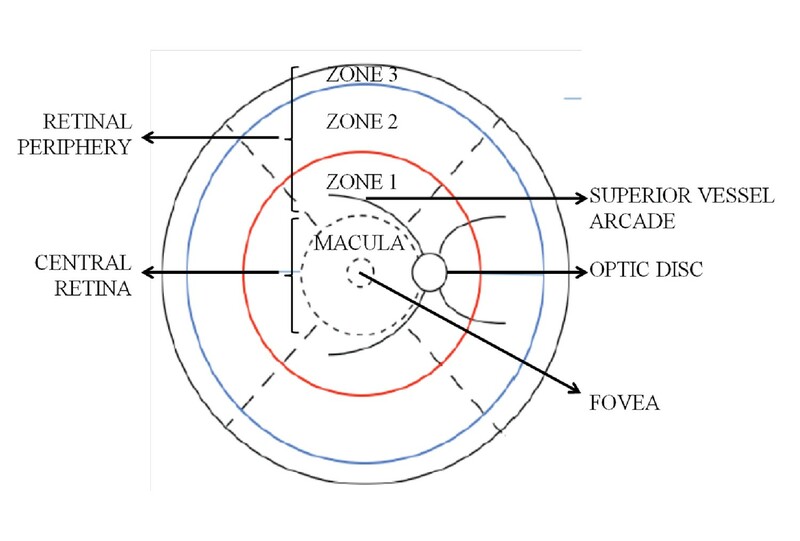 Macula: defined as the zone of retina within a circle centred on the centre of the fovea, which is the central retinal area with highest photoreceptor density. Macular boundaries are defined by vessels arcades. Peripheral retina: defined as all retinal tissue lying outside the macular borders, divided into quadrants (temporal, superior, nasal, inferior) which are all graded separately during ophthalmoscopy. Gradeable peripheral retina was measured using zones (zones 1–3). Retinal whitening was graded separately from the MR grade, yielding four severity grades. In order to assess the extent of macular involvement in whitening, macular zones of involvement were compacted into a notional circle using the optic disc as the nominal equivalent of a disc area (DA). Macular whitening severity grades are: none,<1/3 DA, 1/3–1 DA and >1 DA. Peripheral whitening was also graded into four categories: none, Grade 1, Grade 2 and Grade 3 for each retinal quadrant, with a summation score to allow for the possibility of one or more quadrants being unobservable. Journal of Infectious Diseases 211:1977–1986. The American Journal of Tropical Medicine and Hygiene 75:790–797. The Journal of Infectious Diseases 199:263–271. The American Journal of Pathology 180:235–245. The American Journal of Pathology 178:2146–2158. Frontiers in Cellular and Infection Microbiology 5:18. British Journal of Ophthalmology 68:698–707. Cellular and Molecular Neurobiology 32:159–165. Progress in Retinal and Eye Research 27:622–647. The Journal of Immunology 165:4658–4666. Transactions of the Royal Society of Tropical Medicine and Hygiene 102:1089–1094. The Journal of Infectious Diseases 187:1342–1345. The American Journal of Pathology 156:965–976. Tropical Medicine & International Health 14:802–809. The American Journal of Tropical Medicine and Hygiene 58:673–683. The American Journal of Tropical Medicine and Hygiene 69:345–359. New England Journal of Medicine 372:1126–1137. The American Journal of Tropical Medicine and Hygiene 98:516–519. Thank you for submitting your article "Neurovascular sequestration in paediatric P. falciparum malaria is visible clinically in the retina" for consideration by eLife. Your article has been favorably evaluated by Prabhat Jha (Senior Editor) and three reviewers, one of whom served as a guest Reviewing Editor. The following individual involved in review of your submission has agreed to reveal his identity: Charles Newton. Overall this is a well written, comprehensive clinical review by leaders in the field with new insights into the clinical pathology and pathogenesis of neurovascular sequestration in malarial retinopathy. Many of the conclusions are reconfirming previous clinical observations and outcomes the study team has already published on but on a larger sample size. The associated clinicopathological evaluations are firsts in describing the pathology of the retinal findings, though only a limited number of unique samples were assessed. The FA and immunochemistry results further delineate and expand on previous findings by the group but with new novel findings on a cellular and molecular level. 1) The clear delineation of what work was presented in this manuscript is an extension or summary of previous work published versus new novel research being presented for the first time in this publication. 2) Retinal findings and associated conclusions regarding these findings require additional consideration and analyses, including multivariant analyses, correlation with brain findings (imaging/tissue markers), impact on clinical diagnostic criteria, and further identification and assessment of additional relevant variables/confounders. 3) In general, the manuscript comes across a bit overwhelming in the breadth of information provided and is difficult to follow as a cohesive narrative. Further clarity on what populations were used for what analyses (and again if this is new or an expansion of previously published data) is needed as well as improvements on how all the findings presented diverge into a common narrative at the conclusion of the manuscript. We recognise that this publication reports research on a cohort of patients from whom data has been published previously by us and others in our group. The dataset is large, complex and unique and has been added to over 15 years to address complex questions as they have emerged. In the case of the work presented in this publication we set out to understand sequestration and its relationship to clinically identifiable features on ophthalmoscopy. The focus on ophthalmoscopy is important because it opens up opportunities to improve clinical management of comatose children with advanced CM. Our previous work on vessel changes and whitening has described the clinical appearance but not established the aetiology. In Beare et al., 2004 we gave descriptive data and uni- and multivariate analyses of 278 clinical examinations performed between 1999 and 2003. We identified “vessel changes” and retinal whitening as associated with death (OR: 2.4, 2.0 respectively). In the publication under review now we extended our previous analysis of 5 years’ clinical data to 15 years to confirm the clinical importance of specific features of MR and identified orange vessels and foveal whitening as important predictors of death. We used these findings to design our clinicopathological study. The histological data presented in this manuscript is presented for the first time. We, with others, have published four previous papers on the retinal histopathology of CM. Lewallen et al. (2000) (n=6) and White et al. (2009) (n=64) reported descriptive and correlation data from a different cohort from the same autopsy study, describing sequestration in retinal vessels and identifying a relationship with death from CM. Some of the cases in the White 2009 dataset were used in constructing a new dataset for the novel topographical clinicopathology study that we present in this manuscript. Our previous paper from this new cohort of cases (Barrera et al., 2015) reported differential sequestration rates in different ocular tissues. The paper from Griener et al studied brain-retina correlations in haemorrhage, ganglion cell axons and barrier integrity. All these studies reported sequestration in retinal vessels but without clinicopathological or topographical correlation. The clinical relevance of the features visible on clinical examination has not been well established. In Beare et al., 2009 we gave descriptive data on the images from fluorescein angiography of 34 cases in the 2006 season. We described the intravascular material but its cause and significance remained unknown. Since then we have recruited a further 226 children to create our image analysis dataset allowing association studies that have not been feasible previously and data from semiautomated image analysis that is novel. We have reviewed the descriptions of the datasets and have restructured the final paragraph in the Introduction and the first paragraph in the Materials and methods section. We have taken the opportunity to try to improve the clarity of the dataset descriptors and the study design. Introduction: “We with other colleagues have previously reported descriptive pathological investigations of the features of MR (Lewallen et al., 2000) including clinical associations (White et al., 2009) and suggesting mechanisms. […] The further analysis of our clinical dataset is an extension of our previous association study while all other analyses presented in this manuscript are new”. “A research programme based in Queen Elizabeth Central Hospital (QECH) and the College of Medicine in Blantyre, Malawi since 1996 provided the setting for the study. A prospective cohort of children (clinical dataset) was recruited between 1999 and 2014. A subcohort was selected for ocular histopathology (clinicopathology dataset, 1999 – 2011)and a second recruited for retinal photography (image analysis dataset, 2006-2014)”. Our team has carefully considered these important comments as suggested and give our responses below. We have conducted multivariable analyses, and some additional experiments to add further insight into correlation with brain histopathology for our new findings on tissue effects of sequestration. We performed multivariable analyses of the clinical dataset. We reviewed potential confounders which showed a significant univariate association with death at the level of p<0.01 (see Table 1 unadjusted associations) and where they do in our view fulfill the confounder criteria described by Greenland, Pearl and Robins, 1999. We did not include two variables that we believe do not meet Greenland’s criteria: coma score (part of the causal pathway to death) and retinal haemorrhages (orange vessels can evolve to haemorrhages due to sequestration affecting vessel stability). We included white cell count, lactate, HRP2, papilloedema as potential confounders. We also included age as it has been previously identified as a potential confounder in other paediatric CM studies. We ran two separate regression analyses of outcome=death for the two ophthalmoscopic features of MR that are the focus of our study, as mentioned in the Introduction: orange vessels and foveal whitening. Both of the variables remained significant (p<0.01) and odds ratios were similar. Both analyses add further evidence of the association of orange vessels and foveal whitening with death. Both analyses reported above were run on data from the worse eye, but significance did not change when two eyes were assessed separately (not shown). We have added brief statements on these results, and related methodology, in the revised manuscript. Materials and methods: “Relationships between clinical dichotomous outcome and studied variables was first analysed using simple logistic regression. […] We did not include variables not fulfilling the confounder criteria described by Greenland et al. (Greenland, Pearl and Robins, 1999): coma score (part of the causal pathway to death) and retinal haemorrhages (orange vessels can evolve to haemorrhages due to sequestration affecting vessel stability)”. We acknowledge the importance of comparing retinal and brain findings. This paper is focused on the retina and we believe that adding in analyses on brain imaging and tissue markers will greatly lengthen the paper. However we have used this opportunity to review the discussion on the retina/brain correlates undertaken some additional brain histology to extend our new findings in the retina on pericytes. We have added in data on pericyte markers (SMA and PDGFRβ) in cerebral cortex sections from 5 cases with or without MR positive CM. The cases were from the patient cohort included in our manuscript, thus data corresponding to retinal staining are available. A minimum of 50 parasitised and non-parasitised microvessels were counted per case, by 2 independent observers (VB and LHC). In these brain samples, we found a significant reduction of normal pericytic SMA and PDGFRβ staining, in the presence of pRBC sequestration (median% , min-max% of vessels with SMA intact: 15%, 9-20%; PDGFRβ: 13%, 6-24%), compared to non-parasitemic vessels (SMA intact: 92%, 79-100%; PDGFRβ: 96%, 91-100%) (p<0.001 for all). These proportions are very similar to those observed in MR positive and MR negative cases. This suggests that retina and brain present a similar dysfunction/loss of pericytes in fatal paediatric CM. Discussion: “Pericytes are highly sensitive to hypoxia (Kamouchi et al., 2012), especially in brain and retina where they are most abundant, and when vessels lose or develop abnormal pericytes they become hyperdilated, show signs of vessel dysfunction and may haemorrhage (Bergers and Song, 2005). […] These data suggest that retina and brain present a similar dysfunction/loss of pericytes in fatal paediatric CM”. We considered again the impact of our findings on the clinical criteria used in the diagnosis of CM. The focus of our publication is not on the primary diagnosis of CM but on the previous uncertainty of the role of sequestration in the features of malarial retinopathy, as well as the identification of those comatose children who can progress to advanced and fatal CM. The identification that orange material is sequestration adds strength to the importance of the previously poorly understood “vessel changes” in making the diagnosis. The separation from white vessels may also prove helpful. However our study presents some limitations as the studied cohort does not include comatose children without CM. We have added some emphasis to paragraph eleven of the Discussion. Discussion: “Our new clinical markers of severe disease and poor outcome (visible orange vessels and arteriolar involvement indicating severe sequestration, and severe foveal whitening) should be a focus for diagnosis and management”. We recognise that the content of our manuscript is extensive. As stated in our covering letter we decided to study 3 datasets from our longstanding research programme designed to provide sufficiently new and definitive evidence in response to the comments from our submission of the histopathological data in 2015. We have tried to offset the large amount of data by concentrating only on sequestration and its tissue effects. We have addressed and clarified the populations studied in our response to point 1. We thank the parents and guardians of the patients participating in the study. We thank Dr Simon J Glover for retinal examinations and data collection, and Drs Macpherson Mallewa, Dr Karl Seydel and the nurses of the Paediatric Research Ward at the Queen Elizabeth Central Hospital, Blantyre, Malawi, for caring for the patients. We thank Susan Lewallen for her contribution to the evolution of concepts within the manuscript. We thank Mr Tobi Fishpool, Miss Sohmal Musini and Mrs Duaha Ghafouri from University of Liverpool for their assistance with the histopathology quantitative analysis. Human subjects: The core and specific studies all received approval from the Research Ethics Committee at the University of Malawi College of Medicine P. 11/07/593, Michigan State University and the Royal Liverpool and Broadgreen University Hospital Trust n. 3690. Research was performed in accordance with the Declaration of Helsinki. Written consent for the clinical eye examination was sought in English or in the language of the parent/guardian who gave permission on the patient's behalf. If a patient died, additional informed written consent for autopsy was sought from the parent/guardian. © 2018, Barrera et al.